Early in her life, Georgia Mills Jessup became an artist along with 29 other family members with jobs in the arts. She was a well accomplished painter, ceramicist, muralist, collagist, and sculptor. She started creating art at a very young age and continued for the entirety of her life. Georgia Mills Jessup was one of 18 children born to artists Joseph and Margaret Jessup in Washington, D.C. on March 19, 1926. At a young age, Jessup studied under the Works Progress Administration (WPA) artist, Herman L. Walker. At the age of 13, Jessup exhibited two pieces of art at the Worlds Fair in New York. In 1959, Jessup received her Bachelor of Fine Arts degree ceramics and sculpture from Howard University. She continued her studies at Catholic University where she got her Masters of Fine Arts degree in 1969. She studied at American University and finally finished up her schooling at Columbia Teachers College. Ethnically diverse, Jessup described herself as a “melting pot.” This was because she was both African American and Native American, a descendant of the Pamunkey Tribe of Indians of Virginia. She was able to apply this term when referring to the mastery of her many art mediums. In her adult life, Jessup was a public school teacher in her home town of Washington D.C. After 13 years of teaching, she became the supervisor of art education for the system. She founded “The World is Your Museum,” and was the first artist in residence at the Anacostia Community Museum. 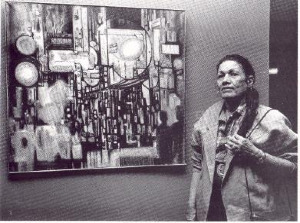 Her painting, Rainy Night, Downtown, was one of her most famous works of art and can now be seen at the Washington D.C. National Museum of Women in the Arts. Georgia Mills Jessup passed away in her home in Columbia, Maryland, on December 24, 2016 at 90 years old. She is remembered by many, including her four children. Her work is and always will be admired.